Dixon Bowen is in for Cole Smith. The rest of the lineup is the same. No changes. Brock Boeser now has 10 points after four games. Check out the highlights from last night's game... Both teams put in good efforts and UND used their skill to take the game away from BSU. I also thought UND got a huge break on the penalty shot. Take a look for yourself. I've had a few people ask about the fourth Beaver goal. The game-tying goal. Some have said that the playoff was offsides. I watched this play over and over again, the puck doesn't come out. But where is it? Another Traditional Circle of Sticks.... UND crunches the Beavers 5-1. It was a good weekend for UND hockey. The men and the women both secured series sweeps. Referees: Todd Anderson, Brad Shepherd. Linesmen: Andy Dokken, Justin Hills. This weekend, the University of North Dakota entertains the Bemidji State Beavers in an important two game WCHA series at Ralph Engelstad Arena March 1-2, 2013. This is the last home game of the regular season. 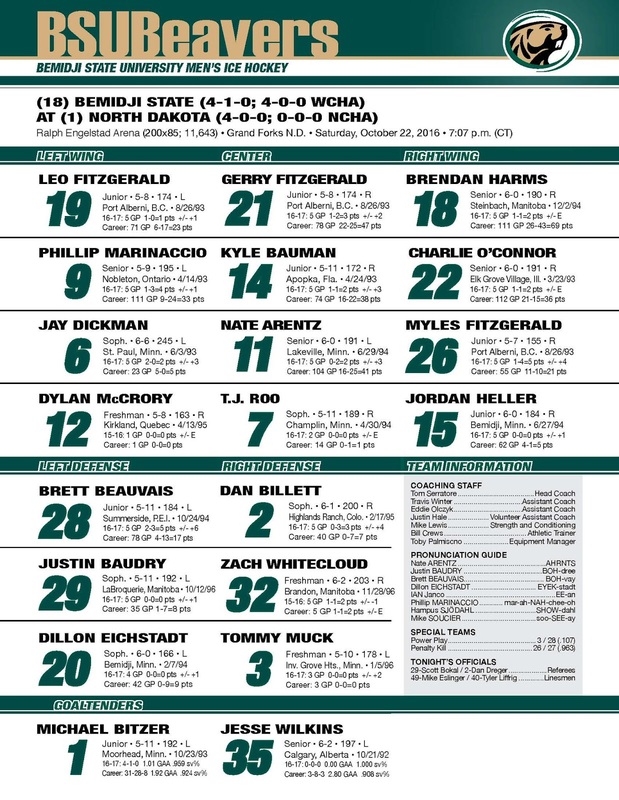 Matchup: North Dakota (17-9-6, 12-6-6 WCHA) #6 versus unranked Bemidji State Beavers (6-17-7, 5-13-6 WCHA). Radio: UND 96.1 (KQHT-FM) – The Fox. SERIES HISTORY: All-Time, UND leads the series 24-2-1 (.907). 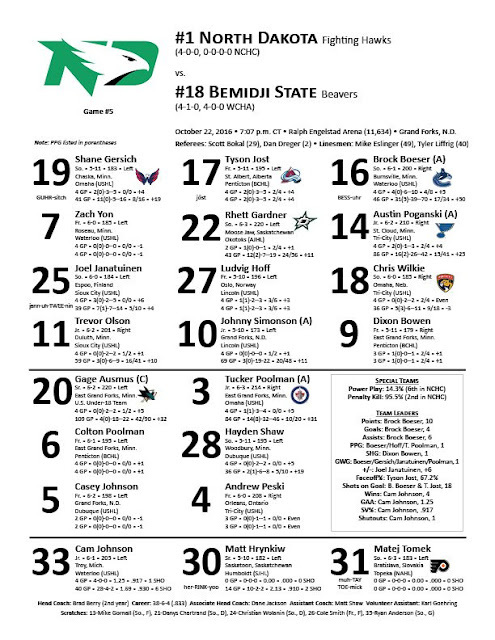 Against the Beavers in Grand Forks, UND leads the series 16-1-1 (.917). 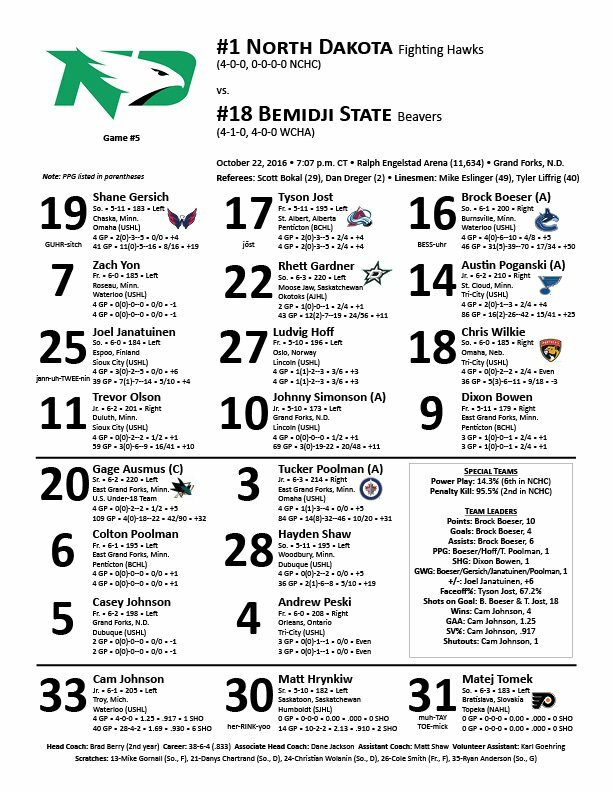 Against the Beavers in Bemidji, UND leads the series 8-1-0 (.889). Last 10 games against the Beavers, UND leads 9-1-0. North Dakota: Forwards: Corbin Knight (14g-29a—43pts), Danny Kristo (20g-23a—43pts), Rocco Grimaldi (12g-15a—27pts), Mark MacMillan (10g-11a—21pts), Carter Rowney (8g-13a—21pts), Drake Caggiula (6g-8a—14pts). Defense: Dillon Simpson (3g-17a—20pts), Derek Forbort (4g-9a—13pts), Joe Gleason (4g-10a—14pts) Jordan Schmaltz (2g-8a—10pts) Andrew MacWilliam (1g-7a—8pts). Goaltenders: Clarke Saunders 11-6-4, 2.31 GAA, .916 save percentage, Zane Gothberg 6-3-2, 2.60 GAA, .916 save percentage. Bemidji State Beavers: Brance Orban (8g-12a—20pts), Jordan George (8g-9a—17pts), Aaron McLeod (11g-5a—16pts), Danny Mattson (3g-13—16pts), Defense: Matt Prapavessis (0g-9a—9pts) Brady Wacker (3g-5a—8pts), Sam Windle (2g-4a—6pts). Goalies: Adam Walsh 5-10-5, 2.60 GAA, .917 save percentage, Mathieu Dugas 1-7-2, 3.04 GAA, .902 save percentage. I really like Moose Richard’s comment about Sioux fan’s that want Dave Hakstol fired because his teams haven’t won an NCAA title yet. “I find the whole fire Hakstol line out of Sioux fans just absurd,” Moose said. “You look over the body of work. Yes there is no national championship in there, but how many Frozen Fours, nine straight final five appearances. It’s just…Yeah you would like the win the big one. But don’t you like being there every year? Grand Forks, ND – Fighting Sioux defenseman senior Ben Blood last week that, "the playoffs are the best time of year; you get to end other team's seasons." The Fighting Sioux are looking to end the Bemidji State Beavers season and advance to the WCHA Final Five in St Paul next weekend. The Fighting Sioux have hosted the first round of the WCHA playoffs for 10 seasons in a row and have made the Final Five nine seasons in a row. That is currently the WCHA’s longest streak. The Fighting Sioux are looking to make it 10 straight trips to the Final Five. The Fighting Sioux are one game closer to that feat as they won game one of the series 4-1. Eliminating the Beavers is not going to be an easy task; the Bemidji State Beavers are a small, quick and tenacious team that gets pucks deep and fore checks the opposition relentlessly. The Beavers are on top of you from the drop of the first puck to the final horn of the game. True to form, the upstart Beavers didn’t disappoint and they bottled up the Fighting Sioux and gave them a small number of offensive opportunities and carried the play for a good part of the game. The Beavers proved against tonight that they are a tough team to play against and they didn’t give the Fighting Sioux very much and they took away the Fighting Sioux’s time and space. Fighting Sioux head coach Dave Hakstol seemed happy to get the win in tonight’s game. “Well we got a win in game one of the series, playing against a good hockey team, that played awful hard tonight,” Hakstol said. Tonight, was the night of the goaltender. Fighting Sioux junior goalie Aaron Dell brought his “A” game against the Beavers and he kept them off of the score sheet for the first 54.08 of the game, stopping many grade “A” opportunities, many of them many of them down low, the Beavers also hit three pipes. Dell would finally get beat by an Aaron McLeod goal on the power play at 14:08 mark of the third period. I don’t think it’s inaccurate to say that Aaron Dell was the difference in this game and a bright spot for the Fighting Sioux tonight. Fighting Sioux head coach Dave Hakstol agreed. For the Fighting Sioux, junior forward Carter Rowney led the Fighting Sioux with three assists tonight. With the loss tonight, the Beavers drop to their record to 17-17-3 and need to win game two of tomorrow night’s series to stay alive. Tomorrow night, it’s win or go home for the Beavers. With the win tonight the Fighting Sioux improve their record to 21-12-3. Game two in the best of three series is tomorrow night at 07:07 pm. The University of North Dakota Fighting Sioux entertain the Bemidji State Beavers in the first round of the WCHA Playoffs at Ralph Engelstad Arena March 9-11, 2012. Game Time: 7:37 pm CT Friday and 7:07 pm CT Saturday Night and Sunday Night (if necessary). Series History: The Fighting Sioux lead the all-time series against the Bemidji State Beavers 22-2-1. The Fighting Sioux have a 14-1-1 record at home against the Beavers. The Sioux and the Beavers split the season series 1-1 in Bemidji back on November 19-20, 2011. Since losing to the Beavers back on November 20th, 2012 the Fighting Sioux have gone an impressive 16-5-2. For UND: Forwards: Danny Kristo (17g-23a—40pts), Corbin Knight (12g-22a—34pts) and Brock Nelson (23g-16a—39pts), Carter Rowney (16g-9a—25pts). Defense: Nick Mattson (6g-12a—18pts), Dillon Simpson, (1g-15a—16pts), Ben Blood (2g-15a—17pts). Goaltenders: Aaron Dell .893 save percentage and a 2.87 goals against average. Brad Eidsness .923 save percentage and a 2.09 goals against average. UND Injuries: Taylor Dickin is out (lower body injury), Forward Rocco Grimaldi is out (season knee surgery), Brendan O’Donnell is out (season ending surgery), Derek Rodwell is out (season shoulder surgery). For BSU Forwards: Jordan George (18g-12a—30pts), Shea Walters (12g-13a—25pts), Brance Orban (9g-13a—22pts) Aaron McLeod (8g-14a—22pts) Defense: Brad Hunt (5g-19a—24pts), Brady Wacker (4g-6a—10pts) Matt Prapavessi (1g-12a—13pts) Goaltenders: Dan Bakala .914 save percentage and a 2.57 goals against average, Andrew Walsh .915 save percentage and a 2.37 goals against average. Other WCHA Series (March 9-11 best of three series): Alaska Anchorage at Minnesota, Wisconsin at Denver, Nebraska Omaha at Saint Cloud State, Michigan Tech at Colorado College, Minnesota State at Minnesota Duluth. Labels: UND vs. BSU, WCHA Hockey, WCHA playoffs. Friday (7:07 p.m.) and Saturday (7:07 p.m.) Ralph Engelstad Arena - Grand Forks, N.D.